It isn’t, I now admit to my systematic botanical horror. And with the wife still asleep and me leaving for work soon, I can’t sneak upstairs and find my Newcombs Field Guide to steer me back in the direction of a correct ID. 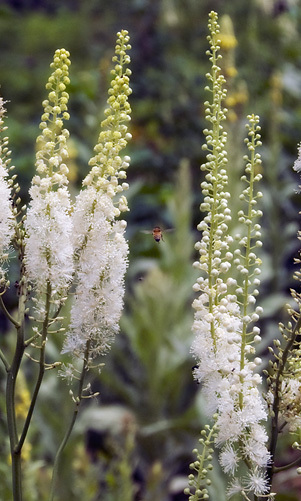 So take a look at the larger version of this shot (with the bee hovering in the middle) and if anybody knows what this plant is, I’m ready to be humbled. I think I know it, but can’t retrieve a name. Flowers are a bit like a meadow rue, but everything else is wrong. I can’t remember what the leaf looks like, but I don’t think there were basal like Fly Poison. For scale, the tallest plants of pure white flowers stand taller than my head (> 6 feet). 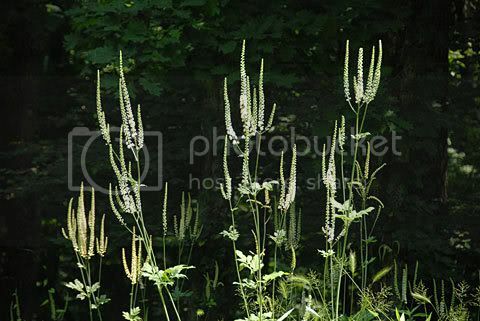 UPDATE: The big DUH: the flower is Black Cohosh. Common. Familiar. Forgotten. Early botanical dementia. So sad. Of course! No wonder I felt like I knew this plant, just usually in deep woods and not open fields. I took pix last summer. Thanks, Beth, I needed a Dope Slap to remember! Had I bothered to look at the leaves, I’d have nailed it, but I was so wigged out with all the honeybees, I didn’t even look down.